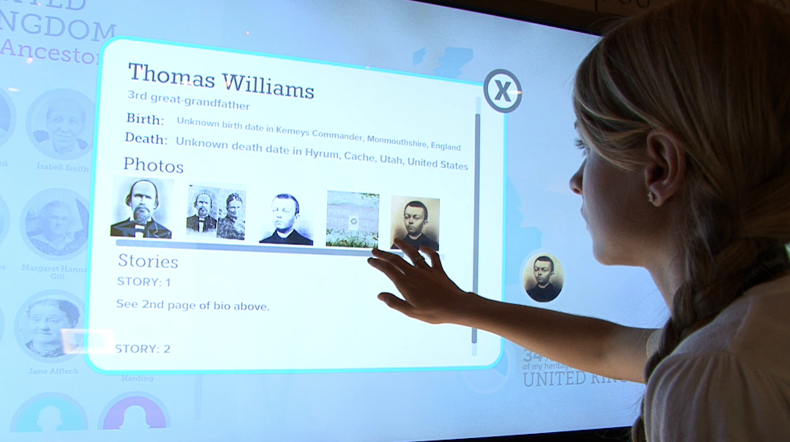 A visitor to the Family History Center in Salt Lake City uses touch screens to sift records in the archives. NASHVILLE, Tenn. (WMOT) -- Tennessee is relatively young as American states go, but has still had time to amass hundreds of millions of official paper documents. Birth, marriage and death certificates, land titles, court records; many of these irreplaceable documents are now rotting away in the dank basements and drafty attics of aging county courthouses. But now an unlikely alliance has emerged to address the problem. 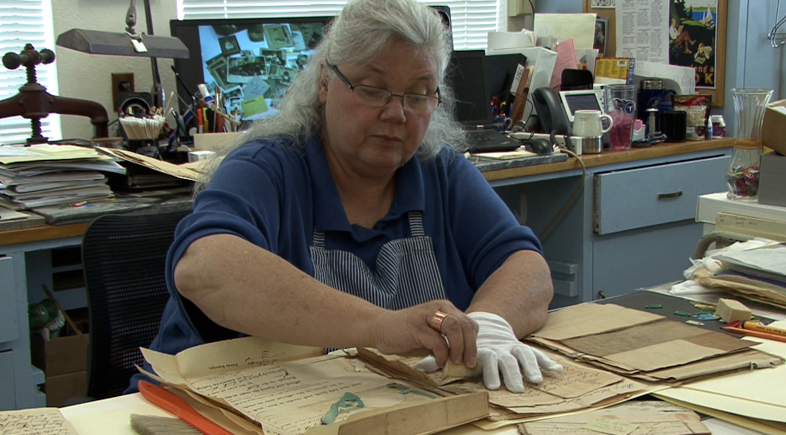 Document conservators like Carol Roberts have been given a daunting task by the Tennessee State Archives. She not only works to restore and digitize state records back to the 1700s, but also helps the state’s 95 counties with their often poorly preserved records. The frequently faded and fragile records have to be painstakingly restored and then digitized. Would you like to listen to this story? Roberts and the state have found an unlikely partner to help with the task 1600 miles away in the State of Utah. The Salt Lake City-based Church of Jesus Christ of Latter Day Saints, commonly called the Mormon Church, maintains the world’s largest collection of genealogical information at its Family Search archives. Raymond Naisbitt is the Archive’s supervisor. Family History Center supervisor Raymon Naisbitt browses through the microfilm library housed at the Center. “Anybody can come in from anywhere in the world and we will sit down with them and help them find their ancestors, both digitally as well as what’s on microfilm,” Naisbitt said. The archives currently contain about 20 billion records, according to Naisbitt, with a million new records added each day. Some records are collected by church missionaries worldwide, while others come through partnerships with public and private sources. All are available to the public without charge. The Church won’t say what it spends on the project, but the labor of thousands of Mormon volunteers, who see it as a religious duty, lessens the expense. “The average church service missionary will serve anywhere from two days a week –16 hours a week– up to three or four days a week. And again they volunteer their time and their service to come here and they give of their time freely in order to help, to assist people, to find their ancestors,” Naisbitt explained. The Church collects the records for religious reasons, and has used them in ways that have sometimes created controversy. 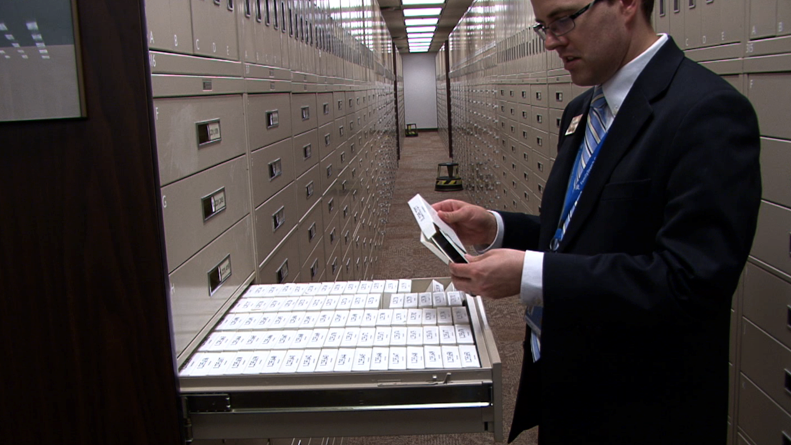 But officials insist the archives speak to a central tenet of Mormon theology. Family is key, according to Archives spokesman Paul Nauta. The church is pushing hard to move its archive into digital media. Custom designed apps now make many records available online anywhere, anytime. Naisbitt says digital access is also critical to developing interest in the young. Records Conservator Carol Roberts cleans documents at the Tennessee State Archives and Museum. “It’s connecting us not only to our past and our present, but for future generations; where my own kids can go on and be able to see photos and stories and memories and documents of me, of my wife, and of my grandparents,” he said. And if you’re computer challenged, the church maintains more than 4800 Family History Centers around the world where you can get free assistance from local volunteers. Middle Tennessee locations include centers in Franklin, Brentwood, Dickson, Columbia, Hendersonville, Clarksville and here in Murfreesboro. Naisbitt says helping others connect with family, past and present, is its own reward. “In many instances we’ve seen people shout for joy, some have shed tears of joy as they’ve connected with the past and seen their ancestors,” he recalled. Tennesseans will soon have their own reason to celebrate. After nine year’s work in the Memphis area, Mormon volunteers have nearly completed restoring and digitizing records in the state’s most populous county.